We have officially teamed up with Warner Bros Pictures for a special newsstand edition of Famous Monsters Ack-Ives: Godzilla! 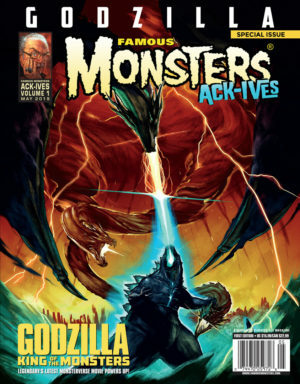 This variant edition features an exclusive cover created by the team at Art Machine for Warner Bros and inspired by the highly anticipated new MonsterVerse picture GODZILLA: KING OF THE MONSTERS, which is due to hit theaters on May 31, 2019! The variant issue will be available on newsstand shelves on May 7 to give you just enough time to peruse it… before the movie swallows you whole. It is also available for preorder on our web store NOW, so don’t wait! GODZILLA: KING OF THE MONSTERS comes on the tail successes of Legendary and Warner Bros’ GODZILLA (2014) and KONG: SKULL ISLAND (2017), the latter of which contained a post-credits scene foreshadowing the debut of MonsterVerse creatures Mothra, Rodan, and King Ghidorah. These three famous kaiju star alongside Godzilla himself in the new movie — though as friends or foes, it’s not entirely clear. 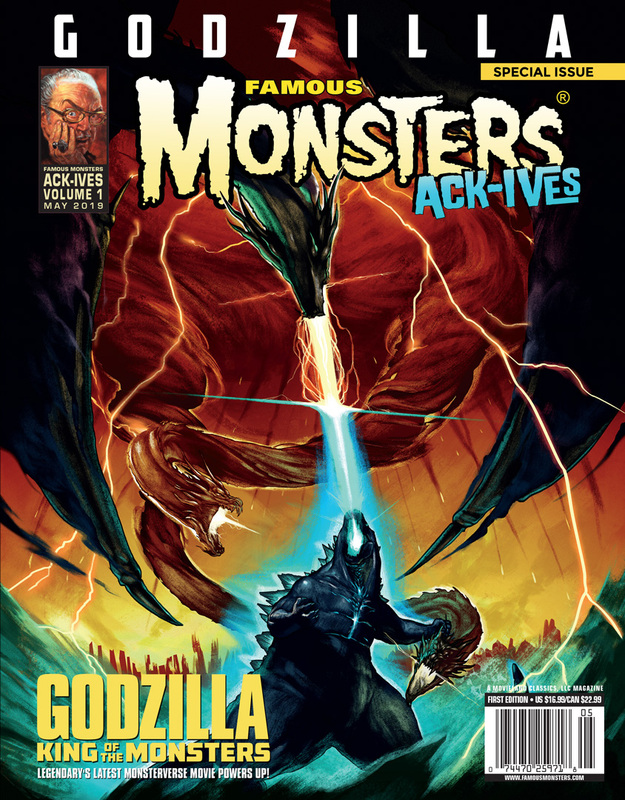 In addition to over 100 pages of long out-of-print content from Famous Monsters’ 60+ year history, Famous Monsters Ack-Ives: Godzilla also contains an up close and personal interview with GODZILLA: KING OF THE MONSTERS director Michael Dougherty. Dougherty is an admitted lifelong fan of the big green beast, and he talks to FM about what fans can expect from the movie — as well as details of his own semi-embarrassing fandom history, which may or may not involve doodling in the pages of his elementary school Bible. Check out the official cover art below, and don’t forget to go see GODZILLA: KING OF THE MONSTERS on May 31! NEW Tarot#117 Sister Skyclad Variant Collections!